Derived from the orginal Roman (Latin) "sanctus" meaning blameworthy, this surname is best described as being of early European origins. It is recorded in every Christian country and in over forty individual spellings from Saint (English), Sant and Saunt (French), Santos and Sains (Spanish), Sainteau and Saintin (French), Santucci and Santello (Italian), and Santesson (Swedish), the name was originally a nickname for a pious person or perhaps, given the robust humour of the period - the complete reverse! 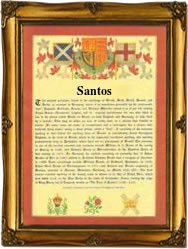 It was also sometimes locational as in the Spanish and Portugese surnames of De Santos, De los Santos and the fused form of Dossantos, all of which describe a person who came from a place called Santos or similar, the original home of a saint or a place that in commemorates a saint. The surname in any spelling is first recorded in England in the 13th century (see below), and these early recordings include Hugh Sant in the pipe rolls of the Abbey of Ramsey, in Cambridgeshire, in 1270, and on the continent Alonso Santos at Arrabal de Portillo, Valladolid, on October 8th 1588, and Munoz de los Santos, at Puebla de la Montalbain, Toledo, Spain, on January 14th 1786. The first recorded spelling of the family name in any form is believed to be that of Roger le Sent. This was dated 1250, in the Chartulary of Rievaux Abbey, North Yorkshire, during the reign of King Henry 111rd of England, 1216 - 1272. Throughout the centuries, surnames in every country have continued to "develop" often leading to astonishing variants of the original spelling.